With bonfire parties this week we’ve been thinking about wrapping kids up in cute knitted items. Making things for children, especially accessories, can feel very quick and it is satisfying to have finished items, plus smaller items are a fun way to try new shapes, techniques, etc. With Christmas coming up we’ve picked out some fun patterns for smaller folks to give you an idea or two. 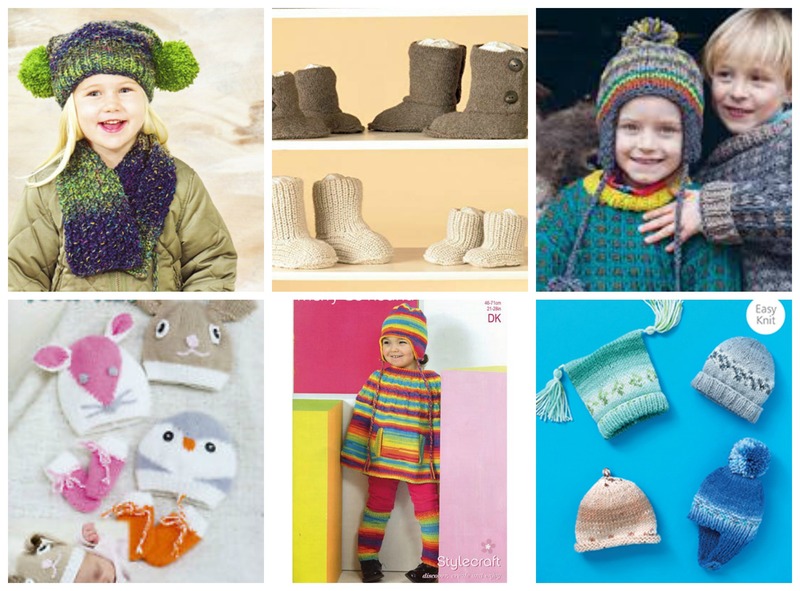 Who doesn’t love a pompom or two, especially kids? The James C Brett chunky hat (top left) is one of the simplest hat shapes and easy to adjust to fit any head. Chunky yarns are a great way to rustle up a quick hat or two in a variety of shapes like the ear flap version from Rico (top right) or the Hayfield hat selection. For a more challenging hat option why not try a bit of intarsia like in the Peter Pan Animal Hats . Kids love colour so have fun with stripes and bright yarns like the cape and leg warmers in Stylecraft Wondersoft Merry Go Round. For a more unusualknit you could try some footwear like the cute Hug Slippers in King Cole Baby Alpaca DK .